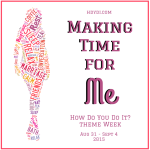 Theme Weeks | How Do You Do It? Raising multiples is a unique adventure for each family and each set of multiples. However, there are recurring issues that are common to us all. On occasion, The Moms at How Do You Do It? identify particular areas of commonality and blog up a storm on the subject for a week. MoMs on Making Time for Our Non-Mommy Selves. Coming August 31 – September 5, 2015. Have an idea for a theme week? Let us know in the comments!